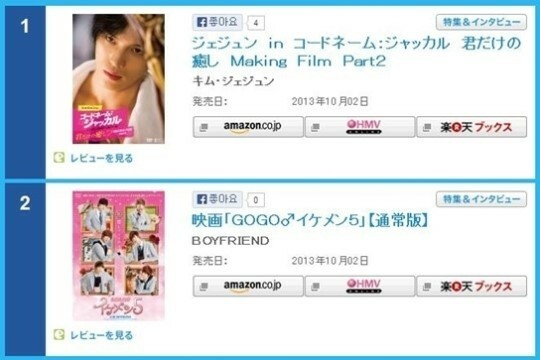 The movies starring Hallyu star JYJ’s Kim Jaejoong and boy band BOYFRIEND have taken the top two spots of the Oricon Movie DVD charts. According to the Oricon Charts, Japan’s biggest album sales charts, Kim Jaejoong’s ‘Jackal is Coming, Making part. 2’ has taken the top spot on the daily DVD movie charts. ‘Jackal is Coming’ is the story revolving around Bong Min Jung (Song Ji Hyo)’s kidnapping of Choi Hyun (Kim Jaejoong) and became the center of attention in Japan for being the movie debut of JYJ’s Kim Jaejoong. The first ‘Jackal is Coming, Making part. 1’ DVD also received a positive response, and took the second place spot on the ‘Best 10 Profitable Korean Movies of 2013’. ‘GOGO Ikemen 5’, the Japanese screen debut of BOYFRIEND, ranked second place on the same charts. Released in July, the movie is a romantic comedy set in a school and depicts the battle between five students to win the heart of one girl. Meanwhile, Afterschool’s fifth Japanese single ‘Heaven’ ranked 6th on the daily single charts.